Is it just me, or is this year starting off with a bang? In a good way, of course! I’m finally feeling like I have a good sense of direction for some non-blog (and non-work) projects I’m working on, and I can’t wait to see where things go in 2013. I’ve been tackling these projects with a renewed sense of confidence and enthusiasm. I’ve been burning the midnight (and morning) oil, but it’s felt great. I’m rediscovering my more geeky roots, and I’ve been having way more fun than I expected. Things I’m forgetting to work into the schedule but need to add: time for reading (books & magazines) and time for reflection. I’m thinking I may need to alternate nights for some of these activities to spread things out. I’m having to cut back on blogging and Zumba a bit, but I’m hoping to pick them up more over time. Reader Request: I’m looking to get some feedback about one of my ideas. Do any of you work/volunteer for animal rescue groups OR do any of you follow any rescue groups or middle men groups that do online fundraising? (Also OR – have any of you used a crowdfunding web site (like GoFundMe or IndieGoGo)?) I’d love to chat about my idea. Please leave me a comment or email me at thechiclife at gmail dot com. One of the projects I’ve recently taken up is blogging for Scoop Charlotte! 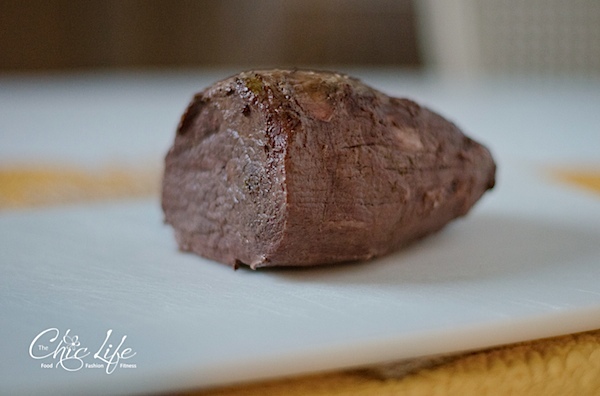 I recently posted a blog for an easy Valentine’s Day recipe you can make without needing to know much about (or even liking) cooking. I’ve shared some additional new-to-cooking tips and tricks on that post (click), which you may enjoy. But, I also wanted to share some of the photos and the recipe with you guys right here on TCL. This is not only a fool-proof Valentine’s-worthy meal but a wonderful everyday-meal, too. I’m a big fan of pot roast. I guess some people don’t think of it as healthy, but I usually opt for a leaner roast cut called “eye of round” that keeps it healthier. 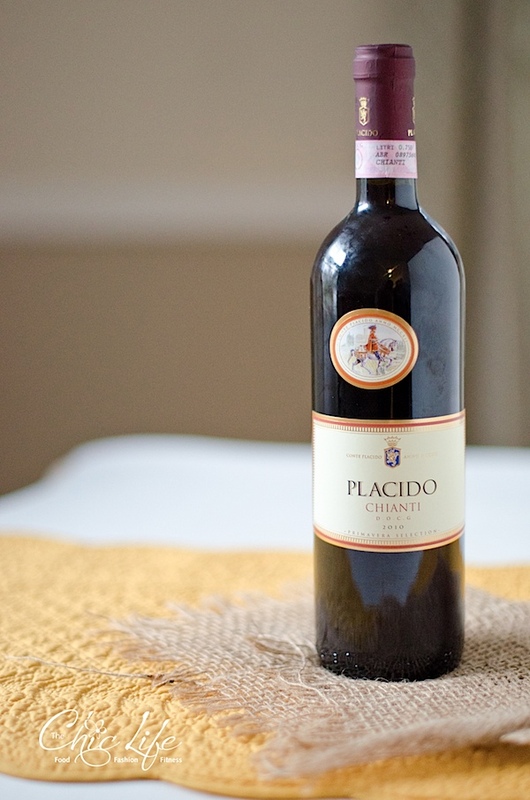 The chianti adds a great dimension to the flavor of the dish and is wonderful served with the finished result. 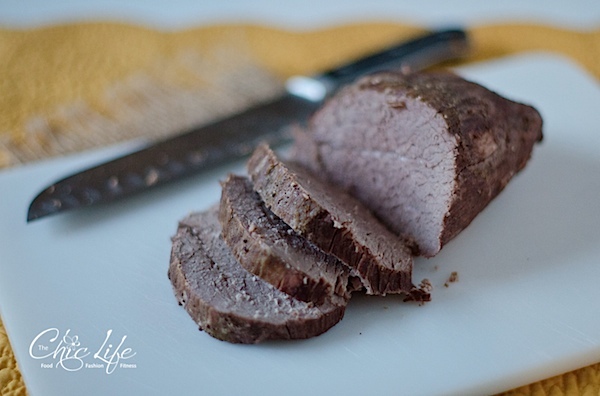 This simple slow cooker meal will make you look like a rock star for a romantic Valentine’s dinner “in.” You don’t even need to know how to cook to make this recipe. Let the slow cooker do all the heavy lifting for you. Be sure to save this recipe for later in the year, too. You don’t have to celebrate anything to enjoy this yummy (and easy!) dinner. Spray inside of slow cooker (cooking vessel) with non-stick spray. Place eye of round in center. In order: sprinkle with salt, pepper, garlic powder, and rosemary. Rub spices into the meat. In order: place potatoes, onion, carrots, and celery around and on top of the meat. 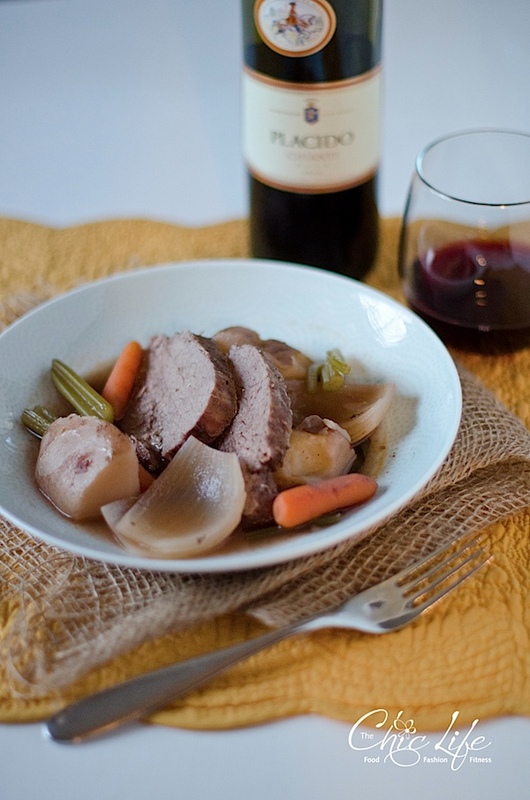 Pour wine over the meat and vegetables. In a medium bowl, add tomato paste. Whisk in beef broth. Pour mixture over meat and vegetables. 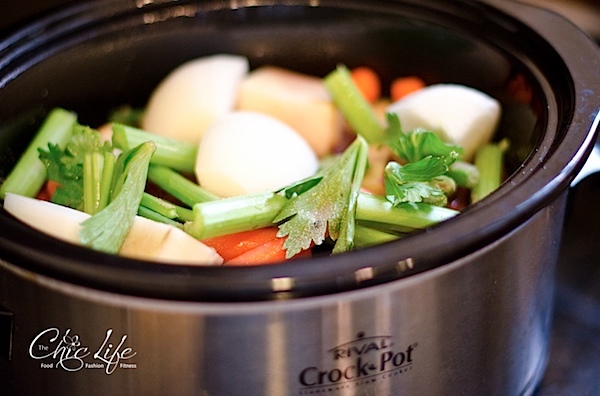 Cover slow cooker and cook for 7-8 hours, or until the meat is tender to your liking. Remove meat and let rest for 5 minutes. Slice into serving pieces and place in a low bowl with potatoes, vegetables, and broth. 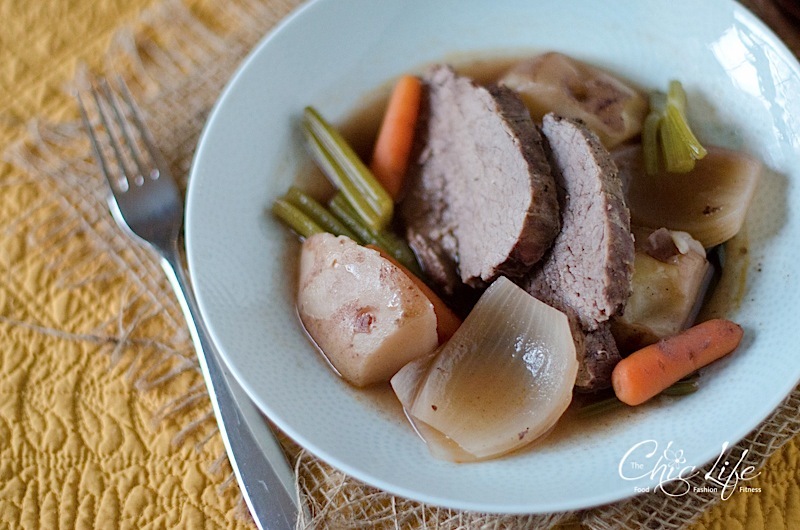 Note: If you used chuck roast, you may wish to skim some of the fat before serving the vegetables and broth. Serve and enjoy! Note: You could serve this over rice, but it will probably be enough to just serve the meat with the potatoes and vegetables. It’s up to your personal preference! If you want to get extra fancy, garnish with fresh, Italian parsley. Click here to get free updates delivered to you (via email or RSS). Be sure to check out The Chic Life on Facebook, too! Reader question: Are you eating in or going out for Valentine’s Day this year? And remember to email me (thechiclife at gmail dot com) if you have any experience: managing animal rescue, donating online to rescue groups, using crowdfunding web sites. Thanks! I think we are going to eat in 😉 We eat out a lot on the other days of the week. Nice! What did you guys end up having?